Scientific name: Puntius semifasciolatus x Puntius sachsii? Size: Up to 4" (10cm), but usually smaller. Origin: Asia, but the gold form does not occur in the wild. Tank setup: Planted tank with some swimming space for this active shoaler. Compatibility: Community tank, an active species but not aggressive. Water chemistry: Not too critical, but soft and slightly acidic preferred. Feeding: Omnivorous, most foods accepted. Sexing: Females are thicker bodied. Breeding: An egg scatterer, which is likely to eat many of its own eggs. Spawning usually occurs in the morning. Eggs hatch in 1-2 days. 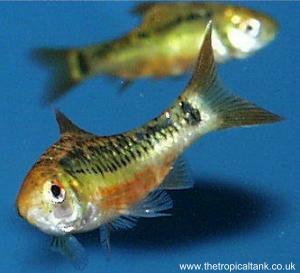 Comments: This is a hardy and active fish, ideal for the general community aquarium. Some sources claim this fish is a tank-bred hybrid of Puntius/Barbodes semifasciolatus x Puntius sachsii, while others believe it to be a cultivated form of wild Puntius/Barbodes semifasciolatus. What is certain is that it is a commercially bred form and does not occur in the wild.